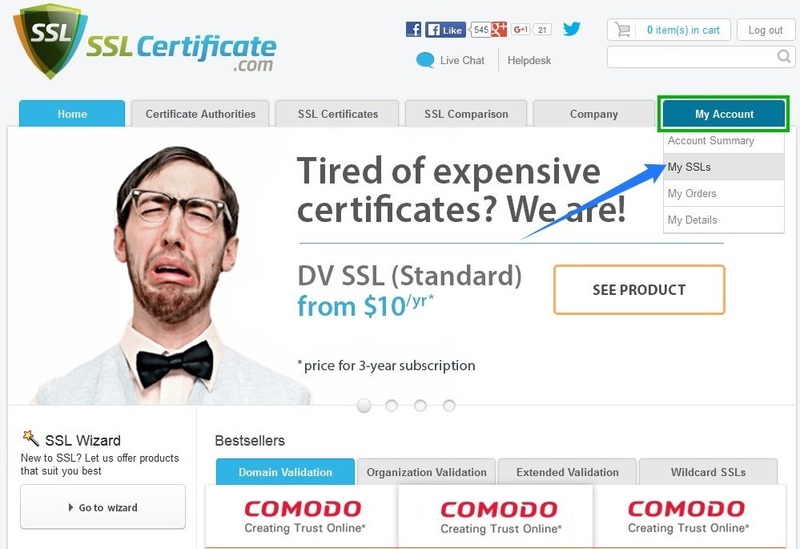 After you have purchased your SSL certificate, you will need to activate it. Before activation, you must first generate a CSR code. This code should be generated on your server either by your hosting provider or by you if your server software allows manual CSR generation. - Keep in mind that you will also need to locate and save the RSA private key, which is generated along with the CSR code and Private Key which is required for your certificate installation. It is not possible to install the certificate without it. - The information regarding the server type (i.e., the software your server is using for CSR generation) can be obtained from your hosting provider. This information will be useful during installation. 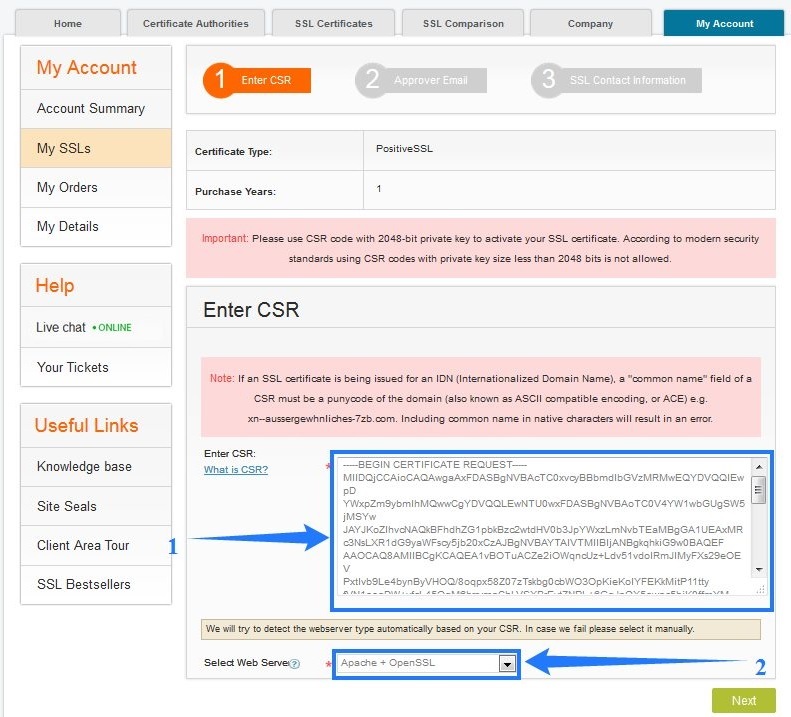 - Once the CSR is generated, login to your SSLcertificate.com account. - Mouse over My Account and select My SSLs from the drop-down menu. - Locate the ID of the certificate you need. - Click the ‘Activate’ button to initiate the activation. - Copy and paste your CSR code, including the following tags -----BEGIN CERTIFICATE REQUEST----- and -----END CERTIFICATE REQUEST-----, then choose the web server type from the drop-down menu. 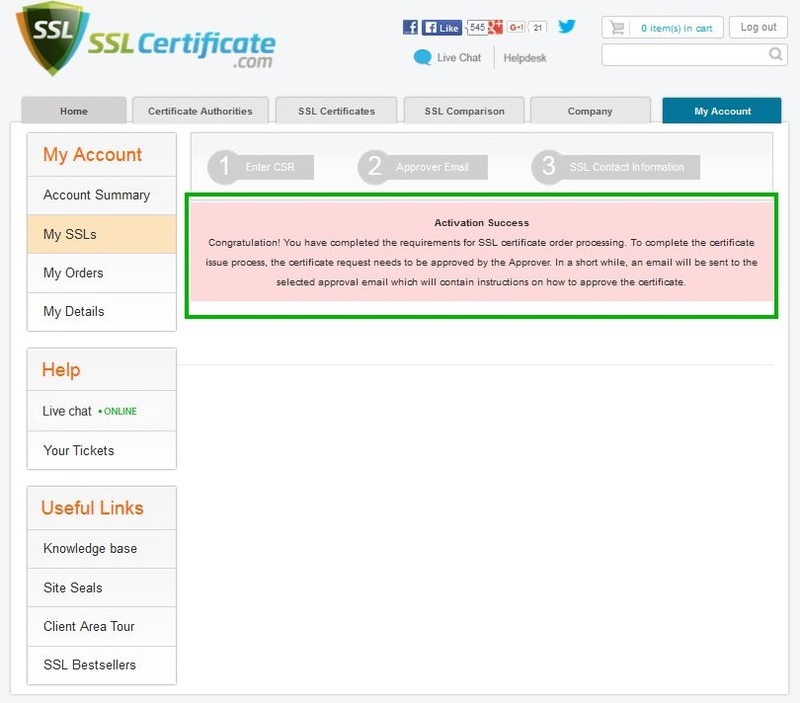 On the next page, select the email which will be used for your certificate validation. NOTE: For security reasons, this approval email can only be sent to a generic email associated with the domain name (e.g., webmaster@, postmaster@, hostmaster@, administrator@, admin@, etc. ), or to the registered Whois email address. Once the correct approval email has been chosen, please tick the box “I confirm that the above message doesn’t apply and the mailbox is set up properly.”, then click “Proceed with the selected email address” button. 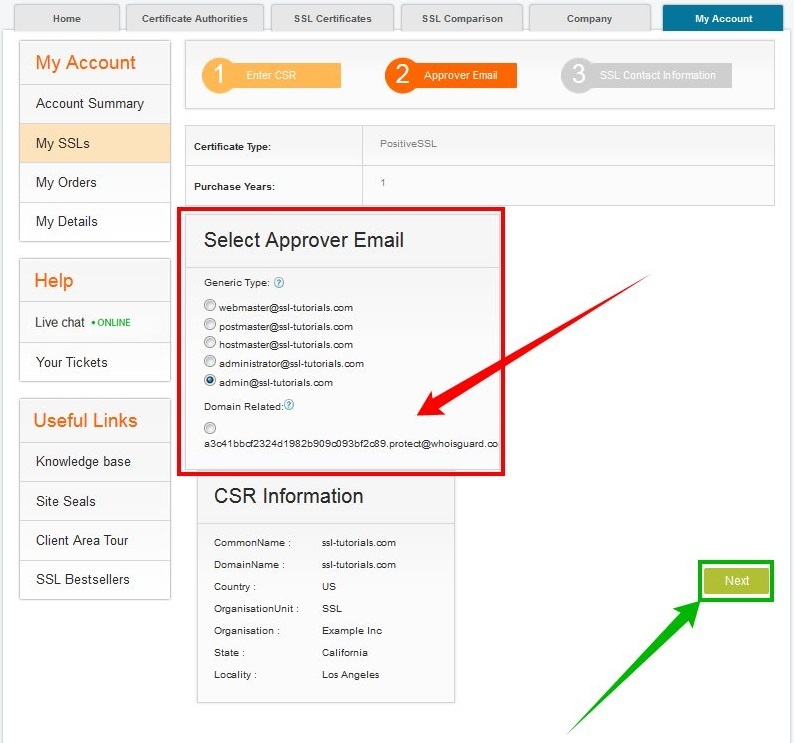 In this step, it is possible to change the approval email using the “Select another approver email” option. Note: If you do not have access to generic email addresses, you may validate your Comodo certificate in a different way. To process it, you must have access to the root folder of your website (for HTTP validation, which means text file uploading into a particular directory of your website (/.well-known/pki-validation/)), or to the Host records of your domain (for DNS validation, which means CNAME record creating in DNS records of the domain name). If you need to switch email validation to any of the methods described above, you can contact our Support Team via live chat or ticket system. Please keep in mind that you are required to choose an approval email during the activation process, since, without it, the Certificate Authority will not be able to confirm your management of the domain and issue the certificate afterwards. In these cases email forwarding can be created for approving your domain name ownership. - In the next step, you will need to fill in the administrative details. This information can differ depending on your certificate type. All required fields are marked with an asterisk. The contact information should be submitted using alphanumeric characters (Aa-Zz and digits 0-9) only. Once all the information is entered correctly, click "Process Certificate"
- If the activation is successful, the following window will appear. Approval emails should be delivered within 10 minutes after activation is completed. 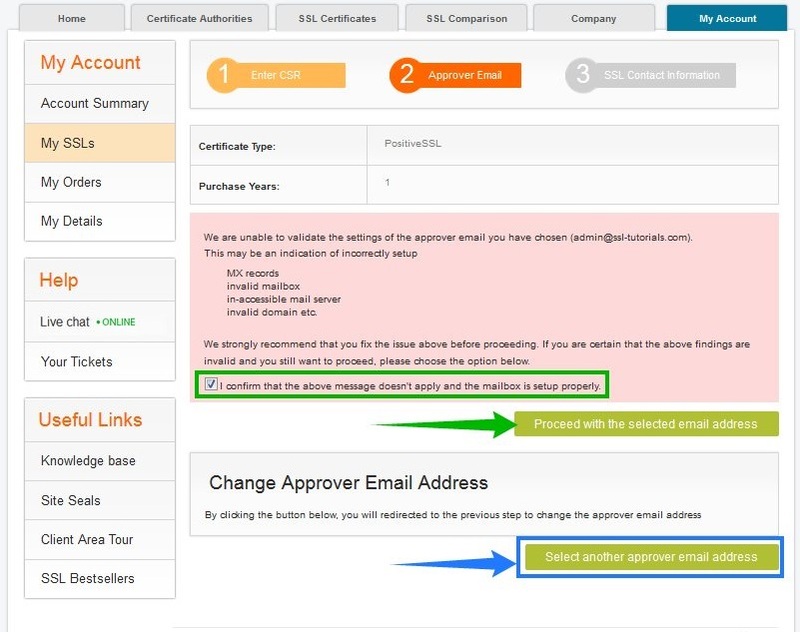 Once the certificate is approved, validated, and issued, it will then be sent to the administrative email address selected during the last step of activation. 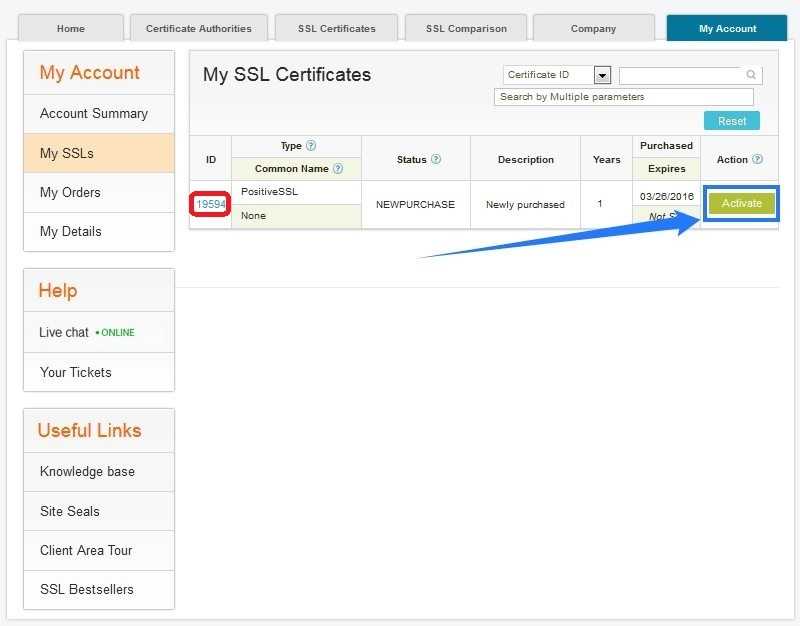 If you order an Organization Validation or Extended Validation certificate, the Certificate Authority will send you a list of documents which are required to verify your business. If you do not receive an approval email within the specified time, please contact our SSL Support Team via live chat or ticket system for further assistance.